A unique and very special ring, this rainbow moonstone and diamond clover cabochon ring in 14K white gold from Apples of Gold Jewelry is not only pretty, but can be worn for special occasions and as an every day ring. The 14K white gold ring features a band that measures 1.71mm wide. The top/face of the ring has dimensions of 7.4mm in size. 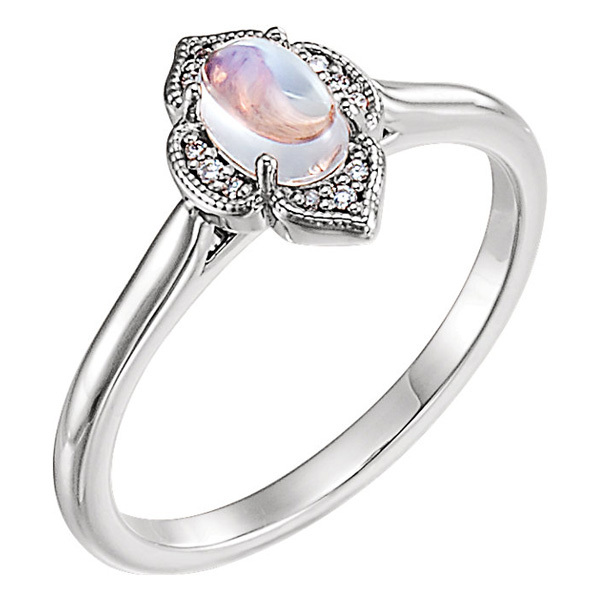 In the center of the ring is a 6mm by 4mm genuine rainbow moonstone, which is AA rated and has a cabochon-cut style. Along the "clover" design that surrounds the moonstone are 0.20 carats of white diamonds (1/5 carat) that are G-H for color and I1 for clarity. This beautiful ring is definitely sight to behold, and will quickly become a favorite. We guarantee our Rainbow Moonstone and Diamond Clover Cabochon Ring, 14K White Gold to be high quality, authentic jewelry, as described above.